ROSENDAHL, Charles E. (1892-1977). U.S. dirigible captain, distinguished himself by successfully bringing part of a shattered airship safely to earth after it broke up in the air. He took part in long-range flights on board the German commercial airship “Graf Zeppelin”. He was in command of the Lakehurst Naval Air Center during the Hindenburg disaster. MORRISON, Herb (1905-1989). American reporter, the only reporter to witness the Hindenburg disaster. Best known for his dramatic report that killed 36 people. His words over the radio: “...it’s a terrific crash...smoke.....fire...Oh, the humanity....” will not be forgotten in the history books. 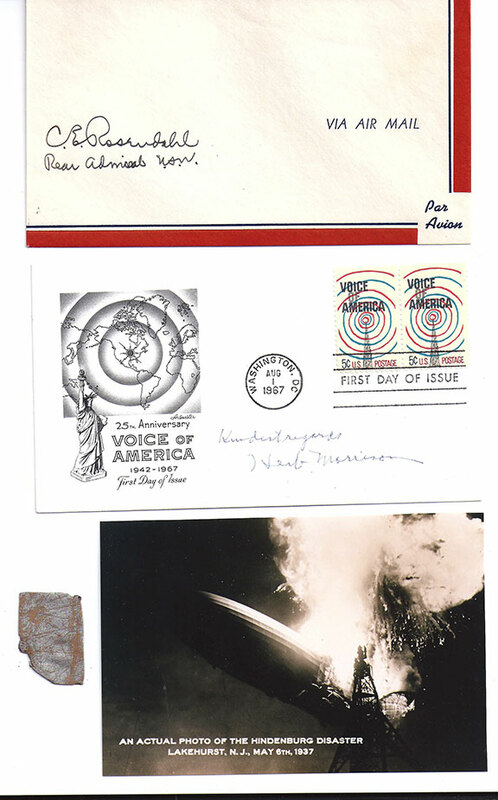 Two covers, one Air mail cover signed “C.E. Rosendahl, Read Admiral, USN” and the other cover, 25th Anniversary Voice of America, signed “Kindest regards, Herb Morrison”.